SlimBoat is a lightweight cross-platform web browser based on QtWebkit engine. However, with the constant evolvement of web standards, the QtWebkit engine has fallen way behind and SlimBoat has become not fully compatible with many websites designed to work with modern web standards only. Therefore, we have decided to discontinue support and further development of the SlimBoat Web Browser. We recommend all SlimBoat users to upgrade to our Slimjet Web Browser, which is based on the high performance blink engine. Slimjet supports most features available in SlimBoat. Compared with SlimBoat, Slimjet is faster, more stable and more secure. In addition, it supports a large ecosystem of plugins and extensions. It also has better support for the modern web standards. 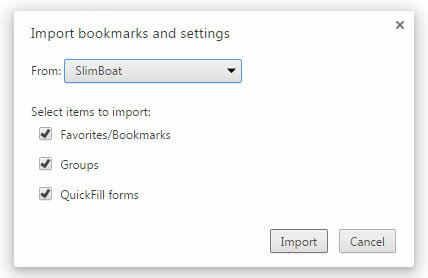 Select SlimBoat from the list of importing sources. Select the items you want to import and click Import button. Then you are all set!